2 Wristbands- A little Bump wherever you are, wherever you go. 2 Round Stickers. A versatile little sticker Bump you can put anywhere. 1 Keychain Bump – Helps keep you present each time you pickup your keys. 1 Presence Pebble – A quick Bump to NOW! 1 Candle Mini-Tin – To light up your Bump! 1 Block Print Unisex T-Shirt – Select your size in the dropdown above. 1 20oz Tumbler – Start your day with a beautiful laser engraved Bump! 1 Mini Talking Stick – A big RHRN Bump in a small reminder. Time has a way of rushing past us, slipping away as we perform thousands of small activities that go unnoticed and do very little to improve our productivity or quality of life. We all have the ability to be more mindful by consciously deciding what we will do right here and actively observing what we are doing right now. This act of living in the present and being in the moment is a proven technique to exist more calmly, increase positive and innovative thinking, and reduce stress. That’s why we offer a whole collection of stress management gifts and mindfulness gift baskets for sale now for yourself, or your friends and family who need a break from the pressure of the past and the fear of the future. 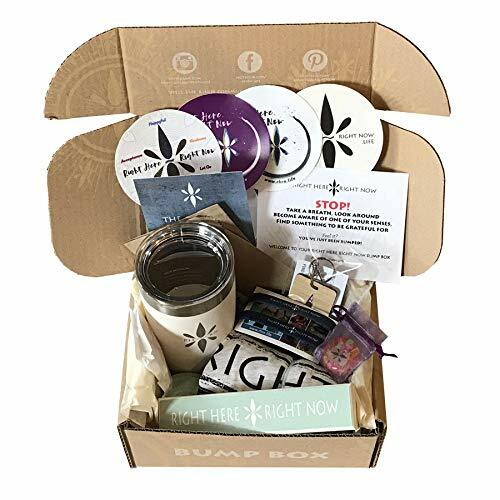 The trick lies in remembering to live in the present, and our mindfulness gift basket compiles a plethora of stress management gifts to incorporate into your daily life.